Installing or replacing your home’s roof is a costly renovation. Your roof is a major investment, and like any investment, you want to protect it. Want to make sure that your investment lasts as long as possible? By following these simple maintenance tips, you can elongate the lifespan of your roof. One of the most surprising roofing facts that many homeowners don’t consider is that gutters cause overflows that travel upwards in roofing. When leaves pile up in gutters, it causes water to build up and rot roof sheathing and rafters. With the simple act of cleaning out cutters, you will be able to save your roof from thousands of dollars of damages. A good rule of thumb is to clean your gutters once per season. This will allow you to ensure that your gutters are free from dirt and debris that can cause harmful clogging. Like many, your home is most likely surrounded by a tree or many trees. Falling leaves are more than just a nuisance in your yard. No matter where leaves are, they easily trap moisture. Leaves that are piling up on your roof are filled with moisture that can gradually decompose and cause major damages to your roof. There are many simple solutions to remove leaves from your roof. Using an inexpensive leaf blower, telescoping pole, or even a car-washing brush can help easily remove harmful leaves from your roof. Trimming overhanging or bushy trees around your home can also prevent leaves from piling on your roof. With simple maintenance of the trees in your yard, you will be able to save your roof from falling particles filled with moisture. Overhanging branches also give access to your roof for rodents. Squirrels, opossums, and other rodents can seek refuge on your roof, while also causing major damage to it. Rodents tend to gnaw on roofing or siding and cause thousands of dollars in roof repairs. With regular maintenance of your trees, you will be able to keep leaves and rodents at bay. With our frequent climate changes, it is important that your roof is protected from heat gain or loss. This can easily be accomplished with proper insulation. Having a gap-free layer of insulation on the attic floor and vapor retarder under the insulation next to the ceiling to will stop moisture from rising to the attic, keeping your roof sturdy and strong. 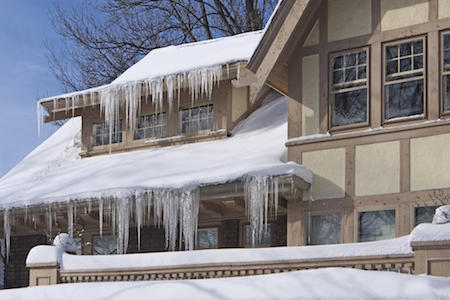 In the winter, you can experience ice build up on your roof. It is crucial to remove some or all of the snow build up on your roof between storms. This will help eliminate the changes of rotting due to moisture damage. Using a roof rake, you can dislodge snow within three or four feet of the gutters. This will help prevent inadequate insulation and air leaks into your attic. By following these four roofing care tips, you will be able to extend the life of your home’s roof.